Guests are welcome to join us at most meetings for a $10 guest fee. nature and conserve our natural resources! ​Gain inspiration for your own Books in Bloom submission. A nationally recognized flower arranger, member Carole Gura will share her tips, inspiration and vast knowledge as she creates one-of-a-kind masterpieces. She is one of our past Presidents, past member and flower show judge of the National Federation of Garden Clubs as well as 1994 Flower Arranger of the Year! She has extensive experience designing for the Museum of Fine Arts, Peabody Essex and Sandwich Museums, Historical Society of Old Newbury, Boston Flower Show and, of course, our own Books in Bloom. ​Two of her beautiful creations will be raffled! auction items, music, delicious morsels and thirst quenchers – tickets are $25. A combined meeting with the West Newbury, Newbury, and Newburyport Garden Clubs. With over seventy articles published in Horticulture Magazine and eleven books written on garden design, Gordon travels from Vermont to appear before this unique gathering of inspired area gardeners. Come hear his ideas to help you create a coherent landscape plan that seamlessly links your house and garden or any other structures in your yard. Susan Guest is an avid gardener, movement educator and fitness coach. With some simple landscape modifications, ergonomic tools and easy exercise techniques, you can retain strength and stability, improve fitness, and avoid injuries while gardening. The Parker River Wildlife Refuge Visitor Services Manager, Matt Poole, welcomes us into their enjoyable refuge center – if you haven’t visited it yet, this is just another reason to attend. ifarm’s mission is to help connect our community to the natural world. This Federal era farmstead has been restored to include a 19 acre permaculture farm. Permaculture and organic gardening will be discussed as well as a tour given of their hoop house, gardens, medicinal herb drying/processing facilities and barn. Solar powered, it is framed by the natural beauty of Towne Pond and the 1,000 acre Boxford State Forest. 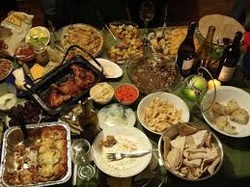 Members will gather together for a potluck dinner and an enjoyable evening with friends. Please bring a food item to share. seeds in most unusual places! ideas to carry them through the holidays and right into spring. Mystery author Neal Sanders presents “a husbands point of view” of gardening. It is filled with humor and insight from someone who gardens less from an abiding love of horticulture than for love of a spouse. Good advice is dispensed and bad debunked! Neal and his wife, Betty, have had their property showcased in the Garden Conservancy’s “Open Days” program and also featured in the Wall Street Journal. He is the author of several mystery novels – including “The Garden Club Gang."